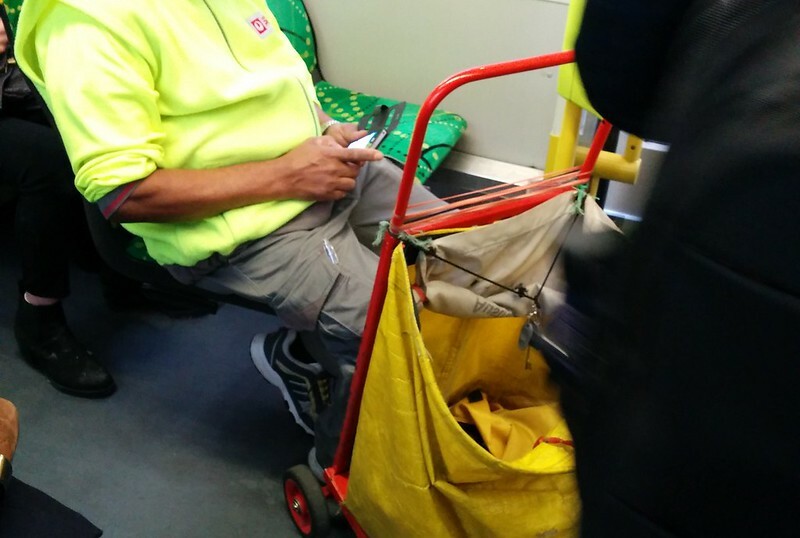 For some time – since well before the introduction of the Free Tram Zone – I’ve seen uniformed Australia Post employees with small delivery carts on board trams in central Melbourne. At first I wondered if this was a good use of space on a tram, given how crowded they can get. But I think it’s arguable that it’s Australia Post being smart about moving (at least some) letters and parcels around a busy urban environment, quickly and cheaply and without taking up the road space that the usual van fleet would take. Now it turns out Amazon is doing something similar in New York City on the subway. Once upon a time many cities had freight trams. Perhaps this is the 21st century version of that. And perhaps it’s yet more evidence that the wheels of commerce can adapt to not requiring motor vehicles to survive and thrive. Next → Next post: Where are the ads? I’ve seen this for several years, too, and wondered if the postal workers were given annual travel passes as part of their jobs. 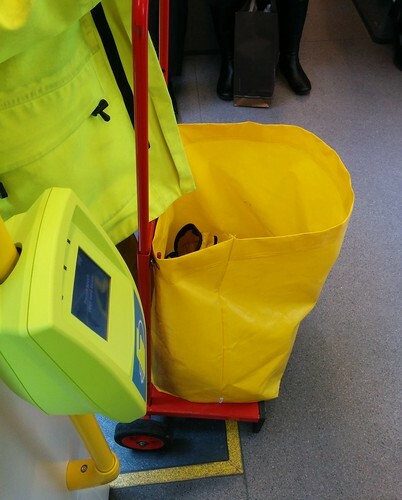 At my CBD office we have a couple of spare mykis for staff to use if they need to make work-related PT trips during the day – generally they are used by execs who drive to work. In the “old days” (when there were conductors who sold you tickets), the posties used the trams in the CBD. Apparently there was a special deal between the M&MTB and the PMG, because the posties had special pre-paid tickets that the conductor was supposed to clip. The posties seemed to be quite happy when the conductor “accidentally” only nicked the side of the ticket instead of in the section square. One suspects that the ticket was then re-used so the postie had a “free” trip home! What about the dabbawalas in Bombay. Top Gear tried to compete against them and lost. So did Hamish and Andy. Given that the Gold Coast has trams that can accommodate surf boards. Surely they can make metro trains that allow dabba wallas to ply their trade for the next 100 years. Meanwhile ANZ runs a shuttle bus the length of Collins St between their two buildings at 55 Collins and Docklands, even though there are frequent, free trams providing a door-to-door service. There was a mail train on the London underground until dickheads decided to ride and then smash it and posted the resulting video to Youtube. Melbourne once had suburban parcel trains. They may have only stopped at stations that had a parcel counter, such as Upper Fertree Gully once did. It reminds me of this: Duncan Gay says no one would carry a fridge on a Sydney tram? Challenge accepted. I’ve done a 10kg sack of rice on a Sydney train, and more recently, general luggage on a shinkansen (Japanese bullet train). But one has to be quite nimble on a shinkansen, because the timetables are very precise (they cannot delay departure for more than a few seconds, eg for slow loading passengers).